This applique was originally created for a hat for my littlest fisherman! They work up super quick and they are very easy. 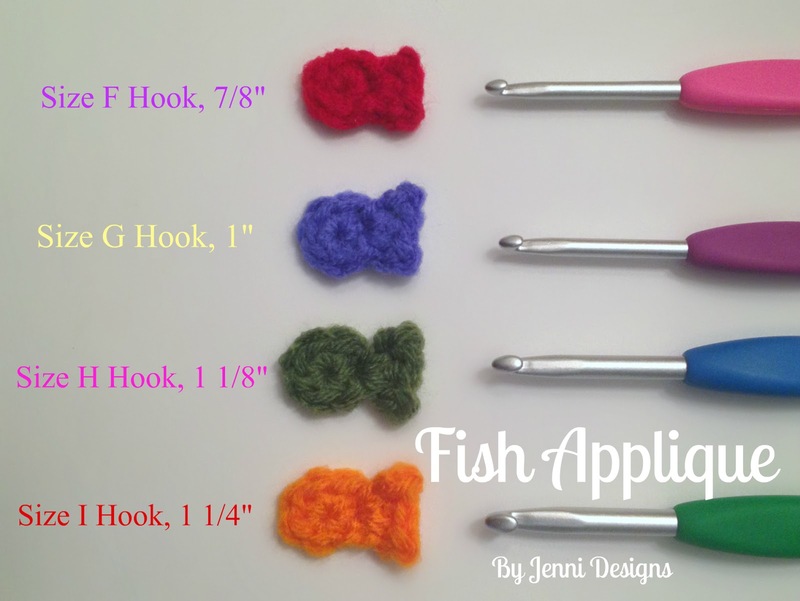 The pattern calls for a size H hook but in the above example I've shown how changing the hook size can yield a slightly smaller/bigger fish applique. -Stitches placed between these brackets [ ] indicate a group of stitches that are all worked in the same space. Row 1: Magic circle, ch 1, 6 sc in circle. Join with sl st.
Row 2: Ch 1, [sc, ch 1, sl st to top of sc, hdc, sc, ch 1, sl st to top of sc] all in same space. Optional: Using a tapestry needle and a small amount of black yarn stitch on a small eye.